Or maybe you live on the other side of the world from me and you are wishing for some cool weather? Either way it's time to cheer up and have a giveaway! I'm joining The Quilting Gallery's Blog Hop Party. . .
. . .and giving away this generously sized fat quarter piece of snow-dyed fabric! Here's a little close up of it's lusciousness. I love the funky designs that come about in snow dyes. Would it make your day to win this fabric? If so, then lets take a minute to stretch our right brains a little and take a Rorschach test (ink blob test) and tell me what you see in the close up image above. For example, among other things, I see a little sideway alien face. I've probably been watching too much sci fi lately. So, to win, leave a comment telling me what you see (and it can't be the same thing I mentioned) and you are entered to win this lovely piece of fabric! I will ship anywhere in the world. 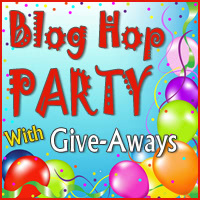 Have a great day and be sure to hop on over to the blog hop and see what else you can win. I will announce a winner on March 16th. Make sure you have are linked to an email address where I can contact you or leave it in your comment. I'd hate for you to win and then I can't find you! Lizard! Thanks for hosting a wonderful giveaway! in the closeup I see a face too, but it really looks like a piece of quartz! I see an angel with her arm pointing to heaven. Thanks for the chance to win. Thanks for pointing out the Alien face.....now that's the first thing I see LOL! I see (in the dark purple) a semblance of a cartoon wolf (almost doing a disco move I'd say). Thanks for a fun giveaway! My snow dyes were a massive fail. Wonder what I did wrong? Great blog - am a new follower! Thanks dor the giveaway, that fabric is lucious. I see a bird, flying towards us. I see fish. Thanks for the giveaway! To me it looks like the underbelly of a lizard crawling over fractured glass. Thanks! Wow! What a lovely piece of fabric...each angle seems to depict a different image...truly lovely.Thanks a million for the wonderful giveaway. Wishing you a superb weekend. I see a baby in a snowsuit. what a fun contest! Dragon's eye. The fabric is stunning! Love the fabric! I see one of the ancient rock art people in it. In the large picture of the fabric I see a snake mouth open and ready to eat me! I see a peony bud just waiting to open. Cool dyed panel! I see a flower trying to burst through a block of ice. I see a jumping frog. I see my wifes favorite vase that my kids just knocked onto the floor all cracked with my youngest holding a bottle of glue saying we can just glue it back together. It reminds me of an insect captured in amber, except in this case the 'amber' is blue! I see a gecko. So fun! LOL I saw frog legs....thanks for the chance. at the bottom it kind of looks like frog legs. beautiful colours. Lizard. Thanks for the giveaway! I see an angel flying(right side in the purple). The purple on the close up view looks like a 'thumbs up'. Great giveaway. I see a bird down below the alien, Thank You! I see rock crystals emerging from a purple ocean! Lovely. I love snow dye. Thanks for letting us visit. Wow! Your work is gorgeous! I see a dark figure holding a staff in one hand and reaching toward a purple figure with the other. Perhaps they are dancers. Thanks for this amazing giveaway opportunity. The fabric is gorgeous looks like multicolored crystal. I use fabrics like this in my art quilts. I see a little bird off to the side. I see the Lake Erie coast line! I see a people dancing. I see a salamander with wings. It's gorgeous! A magician opening up his coat (hand is center right of the dark center) and a dove is flying out of the jacket toward the left. I see a leaf under blacklight. Beautiful fabric, thanks for the chance to win. Looks like a trapped frog. Great dye technique! When I magnified the picture I saw a praying mantis in the center. This is amazing fabric and such a fun way to comment. LOL. Really, it looks like you are looking up through thick ice. Looks like a frozen lake with cracks in the ice. Also your alien has an arm w/hand. It is a DRAGON. The "alien face" is the dragon's left hand. Surely it's a cat's face??? Funky bird on a branch! My grandson is a great dragon hunter. I see a great scaly, slithering dragon that he would love to slay. Beautiful, thanks. I see a little girl creeping out from behind a large crystal formation. I see a lizard and was I ever surprised that a lizard was what first popped into my head. Gorgeous fabric! Here's what I see...looking up from under a frozen layer of water I see a hawk soaring in the sky. It looks like ice crystals to me. Your fabric is beautiful. Thanks for offering a giveaway! I see a fairy walking away from me holding a flower. Thanks for the chance at your gorgeous fabric. Down and to the left of the alien face I see the back of a bird with its wings spread up and out. Fun giveaway idea - many thanks! It is a griffin standing on his back legs and with his wings spread. Maybe he is dancing! A walking tree, with lots of eyes in the branches! I see a gecko crawling up the fabric. Sorry about the deleted comment. My phone deleted one of the words and it didn't make any sense! I see a salamander with a beak, I wonder what that says about me?! The first thing I saw was a lizard, but in the large picture, I see big lips! Some kind of bug with a beak, arms and a banana shaped head. LOL. I wonder what that interpretation says about me? I see a naive body with arms wrapped around it. It looks like a gecko on the other side of my stainglass window next to my front door. I see your little alien face....he kind of looks suprised to be there! I see a dancing bug ! WONDERFUL fabric, would love to win ! It looks like someone was at a carnival on the ice at the bottom of Niagara Falls, and they fell through the icee. Yes, they used to have carnivals down there after the river froze over. Good thing they stopped that practice. Very dangerous. Is it a baby I see in the upper right corner??? Yes, I think so! All I see is a beautiful stone. I see a princess in a flowing robe. thanks! I see a new Dragonfly just stretching it's wings out. Such a wonderful color! Thanks! I can see a mermaid bathing in the sun in the light purple to the right. Neat fabric! I see a tree with no leaves. Beautiful fabric. I see a fairy holding a broom and a shield. Strange, I know! I see a fish but I also see the hand of a fetus.Thank you for the chance to win this lovely prize and taking part in the hop. I would have to tell you in a private e-mail what I saw when I first looked at it. :) But it evolved and now I see and under the ocean scene with seaweed fronds waving and fish swimming. I saw a small hand and wings. Nice fabric - would look nice in my stash! Beautiful fabric. I see fish swimming in the ocean amongst the seaweed. I see a hand. Thanks for the giveaway. I see a man in a top hat dancing with a cane... to the song "Puttin on the Ritz." Love it! I see a stunning bat with deep purple wings flying from left to right into the night. Great giveaway! Email: info@explorefibre.com Check out my blog at www.brandylynndesigns.blogspot.com if you haven't already. I'm in the blog hop giveaway too! I'm sure glad there is no right or wrong answer :-) I see a pretty necklace with exotic shaped beads. Love the snow dyed fabric, guess cause I live in the deep south, we never see snow here. At the bottom of the picture it looks like a lizzard.UGH! I do see your alien though. He is facing sideways. Maybe he saw the lizzard. Thank you for being a part of this Blog Hop. You have the perfect idea to end this winter blues by your snow dyed fabric. Good choice. Nice snow-dyed fabric Lisa, I see cracked ice on a frozen lake. It reminds me of my son's novelty electric current ball...when you touch it, the current jumps toward your touch. The effect is all crackly, (is that even a word?) Thanks for the chance to win! I se beautiful quilting fabric. Thanks for the opportunity to win your giveaway. I see a little lizard climbing up a wall! I see a fish! Thanks for this Great Giveaway! It would make my day to win this Fabulous Fabric! I see a gloved hand on the right. Thanks for the giveaway. I hate to say it, but I can see a squashed frog in there! LOL I dye lots of wool fabric for my hooked rugs, but this piece of cotton you've done is so, so pretty! Looks like the surface of a planet, maybe not ours. I see a pug face! Beautiful colors! I see a naked winter tree. Gorgeous colors. This is the second time I've heard about snow dyeing, I'm going to have to look it up online and give it a try before the snow melts. I see a hand, clutching a heart. Your fabric is so gorgeous! I stared at it for a long time and came up with a dragon? I see an eagle flying over a canyon with a river flowing at the canyon basin. This is just the colors I want to use for cushions on my new couch. Thanks so much. I see one of those images from space of the frozen north. A lizard and I love the fabric! I am new follower and thank you for the chance to win your giveaway. Looks like a bunch of cats ice fishing, and they have their paws over the ice opening, trying to bat at the fish. I'd say one of those sinkholes that everyone's falling into! I see lightening sticking through the Northern Lights! thank you! I see Madonna on the concert stage in a bustier top. I've not heard about snow dyed fabric. Yours is very cool. Hi Deanne, I see some sharks and a hand holding a glass. Thanks for a chance to win. Love that fabric I could just frame it the way it is and call it art. This is beautiful fabric! I see a tree (looking down from above) with a small bird in the middle of it. Fun! I see a scene from a movie when they are looking up at the light through the ice in a lake. SO pretty. I see the tree from the original Wizard of Oz movie that came to life and scared Dorothy with it's hands raised up. Beautiful fabric!!! I see ice crystals. Thanks for the chance to win. You are the winner of my snow dyed fabric! Please contact me at wil_opio_oguta at yahoo dot com. I see a dragon. Thanks for the giveaway. I see several things, a dolphin, a shark fin and a lobster. I love snow dyeing. I have one piece that looks like it has a horned beast in it.